When connected via USB, almost all modern smartphones and portable media devices mount on computer as MTP (Media Transfer Protocol) drives. Unlike USB Mass Storage, which provides raw access to a storage device, MTP operates at the logical file level, and only provides access to selected files and folders on a storage device. MTP devices show up as media drives on Windows computers. You can exchange content between the device and PC from accessible locations using the Windows File Explorer. On Mac, however, there is only limited native support for MTP devices. When you connect a smartphone (including iOS) or a portable media player as an MTP device on Mac, OS X opens iPhoto or Photos app where you can view and exchange photos and videos between the device and the Mac. This might be convenient for iOS devices, as they only provide access to the Camera Roll in MTP mode. But MTP file transfer on other platforms like Android and Windows Phone are usually not limited to just photos and videos, which iPhoto or Photos app on Mac does not have access to. In this article, we’ll explore how to mount MTP devices on Mac and access their contents just like you would on a Windows PC. There are a few free and paid apps that let you access MTP devices on Mac. Usually, the free ones don’t mount MTP device (smartphone or portable media player) as a drive. Instead, they provide an interface to access the device content over MTP. Android File Transfer is a handy application that allows access to the user accessible storage of an Android device when connected to a Mac via USB cable. Follow the steps below to transfer files between your Android device and Mac using Android File Transfer for Mac. Download the installation package from the official website. Open the package file and drag Android File Transfer to the Applications folder. Connect the Android device to Mac via USB cable. Launch Android File Transfer on Mac. The app should automatically detect the device and let you browse the accessible folders within the app’s interface. You can also copy files into the device storage via simple drag and drop. Android File Transfer is only meant to work with Android devices. If you have a Windows Phone device, you need the Windows Phone App for Mac in order to transfer files between your Mac and the device. Windows Phone App for Mac is available on the Mac App Store. The following steps will guide you to transfer files between your Mac and Windows Phone. Download and install Windows Phone app on your Mac from the Mac App Store. Connect the Windows Phone device to Mac via USB cable. If you are prompted to use USB connection, select Yes. If the phone is locked, unlock it. The app should be able to detect your device now. You can now transfer content between your Mac and Windows Phone via Sync option or drag-and-drop. Refer to the official notes for more information on Synchronizing with your Mac. Update: Ever since OS X El Capitan update, Windows mobile devices are no longer detected by the official Windows Phone app for Mac. Microsoft has also discontinued support for the app and has taken it down from the Mac App Store. But if you already have the latest version of the app (version 3.1.1) installed on your Mac, you can try the following third party workaround to get the app working on OS X El Capitan. If you don’t have the Windows Phone App, there is still an app which allows you to transfer files between your Mac and Windows Phone devices. Commander One is a dual-pane file manager with a number of advanced features like hidden files listing, advanced file search, archive (ZIP) support. Most importantly, the PRO version of Commander One supports file transfer between Mac and MTP devices, including Windows Phone. Once launched, Commander One automatically detects a Windows Phone as an MTP device when it is connected to the Mac. On clicking the Connect button, drives associated with the Windows Phone (Phone and SD Card) would be available in the drop down device menu in Commander One. Just select a particular location on your Mac in one of the Commander One panes and choose the Phone or SD Card location in the other pane. To transfer files between Mac and Windows Phone, drag files from one of the panes and drop them on the other. The selected files will be transferred from the source to the destination. You can download Commander One from their official website, which includes 15 day trial for PRO features. If you want to continue using PRO features post the trial period, you can purchase a PRO license (Personal) for $29.95. Additionally, there’s also a Team license (up to 5 Macs) for $99.95 and a Company license (up to 50 Macs) for $299.95. But, as a 7labs reader, you can get a special 30% discount on all Commander One licenses. The apps mentioned above are specific to the device OS (Android or Windows Phone) and does not work with all MTP devices in general. So, if you have an MTP device that does not run on either of the two platforms, or you want to mount your MTP device on the Mac, the above free solutions might not be convenient for you. In such cases, you need suitable drivers to mount MTP devices as a disk drive on Mac. SyncMate is an application for syncing content between the Mac and MTP devices (iPhone, iPad, iPod Touch, Android, Windows Phone or any other Portable Media Player). In addition to that, it also allows you to mount your MTP device as a storage disk on Mac, allowing you to access its contents directly in Finder. SyncMate installs a custom MTP driver bundle to bring in native mount support for MTP on Mac. Thus, you no longer need to install different software programs for accessing different devices. For Android, SyncMate can mount the /sdcard location as a disk drive. The MTP driver lets you browse the Downloads, Pictures, Videos, Music, Ringtones folders, etc. The app can even mount iOS devices on Mac, providing access to a number of files and directories, including Camera Roll (available in the DCIM folder), Books, Recordings, etc. SyncMate is available as a free download with limited features. To use the MTP mount, you need to upgrade to the Expert version, which originally cost $39.95 (Personal license) for 2 Macs. But as a 7labs reader, you can avail a special discount of 30% and save ~$12.00, when you apply the coupon code “SVNLBDSC” while buying or directly purchase from this page. Download and install SyncMate for Mac OS X.
Connect your iOS, Android, Windows Phone or Portable Media device to Mac via USB. Make sure the device is connected as a Media device (MTP mode). Launch SyncMate and wait for the device to be detected. If it’s not, choose Add new under Connections, from the left sidebar and choose the appropriate device type. Once the device shows up in the sidebar, select the plugins (available folders) on the MTP device that you want to access in Finder, and click Done. Now select Mount disk automatically option in the Summary tab and click on Apply. A new disk drive should show up in Finder. You are now ready to browse and modify (if allowed) the contents of the MTP device. 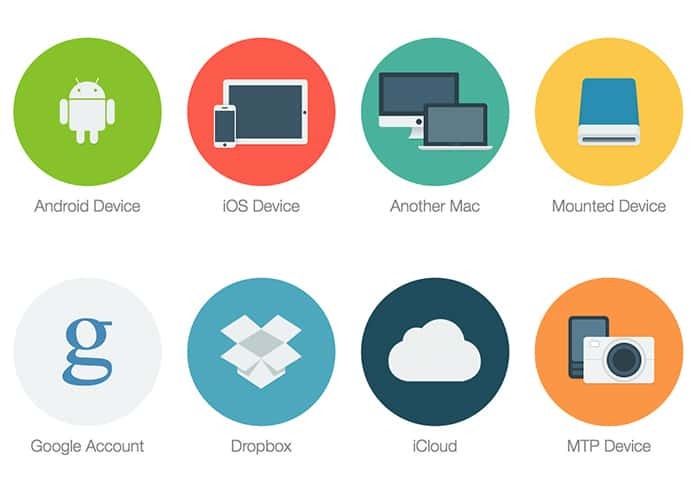 If you know of any other free or paid apps that allow MTP device access on Mac, do let us know in the comments below.